Juke That, your Party Jukebox. Let your guests wish songs, unable to damage anything, and the Automatic DJ takes care that the music never stops. Make your own Karaoke songs and sing to them, and synchronize your libraries with ease. Juke That, your Party Jukebox. Juke That is different. Your guests will notice that, when they wish a song, or when you make your own Karaoke songs and sing to them. But Juke That is more... Juke That is no player like WinAmp or the Media Player. Juke That is a Jukebox. Your guests are encouraged to wish songs by themselves, unable to damage anything. If you like, even protected by password. And when nobody places any wish, the Automatic DJ jumps in. He takes care that the music matches the last wishes played. And he favors popular songs, songs with many wishes in the past. But that's not nearly all. Take the downloadble stickers and you can make your own guest and DJ keyboards. Install a mini PC with these keyboards, and watch your party guests queue in front. Using playlists, the library, the settings of the Automatic DJ, and the rating of songs and genres, you keep control. You can remove wishes or rearrange them, and if you like, your guests may, too. As you like. The Karaoke function is very special in Juke That. Most music games allow you to sing the songs the creators have put in only. That's different in Juke That. Create your own Karaoke! 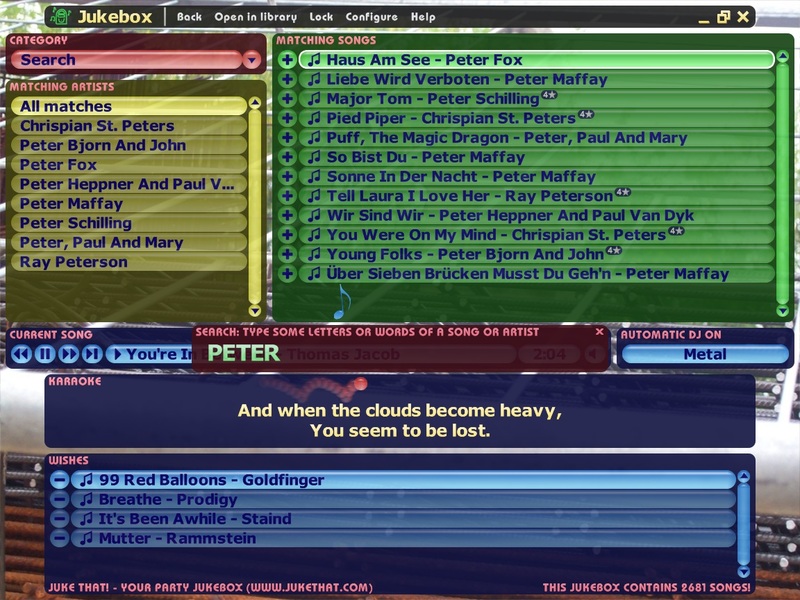 Take a song, add the lyrics, tap to the beat, and you can instantly sing Karaoke in the Jukebox the way you know it: A small ball jumps on the song text that is shown according to the music. Great, great fun. And you can send your creations to your friends, so they can enjoy, as well. Do you have more than just one Jukebox you'd like to keep sychronized? An easy task with Juke That. Connect to another Jukebox and Juke That shows the songs that are new since the last time you connected only. Browse and preview, then download what you like. A free and simple audio player. Features playlists manager, color settings and all the principal tools needed in this type of application...all in a lightweight environment! Fast and clean, no excessive GUI. Play M4A files easily. Make, edit and save playlists with all your favorite M4A files. Easy MP3 Player &amp; Radio is an efficient and easy-to-use application which you can use to play your MP3 files and listen to online radio stations worldwide. Small Internet radio Windows software that runs invisibly in the background and is still nice to control. Not even a click is required to open the software. Volume and new station can be easily adjusted. SSynth.com's MIDI file player is a free utility that plays standard MIDI files through the MIDI port or device you select. Open a MIDI file, select the output of your choice, and use Play, Pause, Rewind and Loop to control the playback of your file. Slow Down Your MP3s, Learn Solos Fast! Control Tempo, Pitch, Loops and More! mTrax will help you become a better musician by making it easy for you to learn all your favorite songs, solos and riffs; any song, any instrument! This site does not contain serial number, crack, keygen Juke That! serial number : serial number is the simplest type of crack. A serial number(cdkey,product key,etc) is register the program as you may already know. a crack or keygen may contain harmful software. If you cannot find the exact version you want, just give it a try. for more information read .nfo/.txt/.diz file include in zipped file.